U.S. crude oil production in the Federal Gulf of Mexico (GOM) set an annual high of 1.6 million barrels per day (b/d) in 2016, surpassing the previous high set in 2009 by 44,000 b/d. In January 2017, GOM crude oil production increased for the fourth consecutive month, reaching 1.7 million b/d. On an annual basis, oil production in the GOM is expected to continue increasing through 2018, based on forecasts in EIA’s latest Short-Term Energy Outlook (STEO). In 2016, eight projects came online in the GOM, contributing to the high production levels. Another seven projects are anticipated to come online by the end of 2018. Based on anticipated production levels at these new fields and existing fields, annual crude oil production in the GOM is expected to increase to an average of 1.7 million b/d in 2017 and 1.9 million b/d in 2018. Because of the length of time needed to complete large offshore projects, oil production in the GOM is less sensitive to short-term oil price movements than onshore production in the Lower 48 states. Recent crude oil price increases have not had a significant impact on operations in the GOM. Rotary rig counts in the GOM—including both gas- and oil-directed rigs—have actually declined since crude oil prices increased following the November 2016 Organization for the Petroleum Exporting Countries (OPEC) announcement to cut production. However, long-term trends also affect GOM oil production. The number of rotary rigs operating in the GOM decreased from an average of 55 in 2014, when the Brent crude oil spot price began dropping, to 22 in 2016. 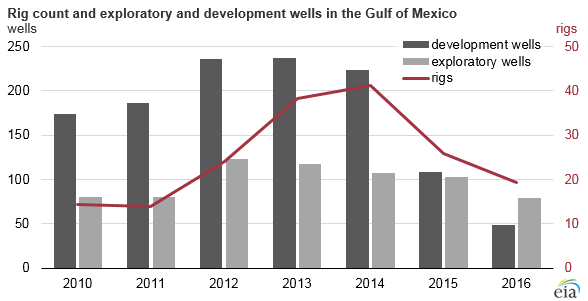 The number of development and exploratory wells has fallen in each year since 2012. Although the number of operating rotary rigs in the GOM increased from 2012 to 2014, falling crude oil prices in 2014, along with drilling delays caused by the 2013 discovery of faulty rig safety equipment, led to decreasing drilling activity in that period. Exploratory wells are favored in the current low-price environment as they allow operators to identify promising areas in the event that oil prices increase. Resources estimated from discoveries made through exploratory drilling can add to the value of oil producers’ inventory of assets. Exploratory wells are drilled to find new reservoirs (in either a new area or in a known field). Once a reservoir has been discovered, development wells are drilled to maximize production from the reservoir, based on geologic conditions, economics, and project timelines. In recent years, the number of development wells has fallen much faster than the number of exploratory wells. This reflects operators taking advantage of the lower day-rates in the current low price environment, with expectations of higher returns when crude oil prices rise and discoveries are brought into production. 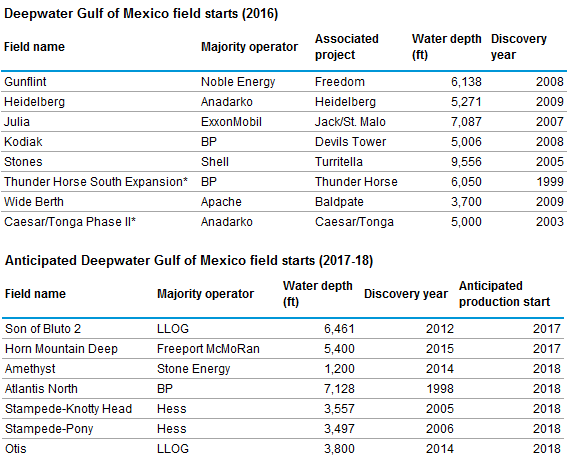 Uncertainties in oil markets may still affect long-term planning and operations in the GOM, and the timelines of future projects may change accordingly. Note: Fields noted with asterisks are redevelopments or expansions. The Caesar/Tonga Phase II complex includes three fields that were discovered separately.